A recent study is out examining the direct relationship between the literacy of young children and their future behavior and success. 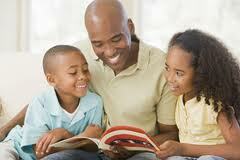 The authors at Purdue University stress the benefits of adults reading to young children between the ages of 3 to 5. As a parent, I’ve seen the positive impact in so many ways on my children, and it’s been an additional joy to see how they have embraced reading. Critical thinking, powers of observation, social cues, and a sense of humor are all nurtured by the process of being read to, not to mention the building of closer relationships. Unfortunately, other studies and reports have reached the opposite conclusion; namely, those children who fall behind in reading skills by 3rd grade may suffer long-term and may even drop out of high school. (Actually, I was saddened to read a few reports citing the fact that government officials have planned for prison occupancy (see page 6) based on poor literacy results in lower grades!) On a happier note, I especially like the list of “pluses” from this blog entry on positive parenting, which includes a short, worthwhile video from Children’s Healthworks on the subject. What else is there we can do with and for our children which costs so little, provides hours of thought and entertainment, and boosts their quality of life? The children’s staff at EPL will have dozens of suggestions, as well. Posted on June 16, 2011 June 18, 2011 by EPLPosted in UncategorizedTagged Children's Healthworks, Jumpstart, positive parenting, Purdue University, reading to young children, relationship between reading and success.